The war arrived early on September 6, 1939. With nearly 6000 Jews living in Belchatow at the time, many homes and businesses were destroyed by fire. 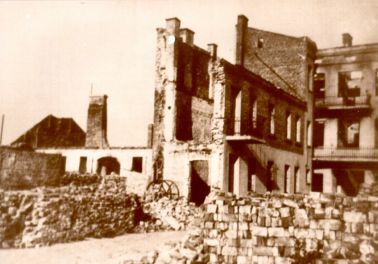 The German army entered Belchatow during the first week of the war and humiliated the Jews during the High Holidays, desecrating holy objects and confiscating property. In the town's New Square (see photo on left), holy books were thrown into the fires and the Jews were forced to watch while dancing and singing around it, stepping on the holy books. Old Jews were forced to eat non-kosher food and had their beards cut. Many Jews attempted to leave, hoping to find safer places. When the Germans moved in during March 1940, many young Jews were sent to forced labor camps. The ghetto or Jewish "district" was created in March 1941, restricted primarily to the streets of Pabianicka, Fabryczna, Krolewska, and Sienkiewicza. However, it was considered an "open" ghetto although some streets in town were closed to Jews. Conditions were crowded, especially since many homes had been destroyed by fire and more Jews from surrounding towns were brought in. Obtaining water, medicine and medical care was extremely difficult. Jews worked in the town and often sold their belongings for food. Illegal trade grew despite the severe punishment of jail, or even death, if caught. Many Jews also sewed clothing for the Nazi Army at a factory taken over by the Germans. Until the middle of 1941, some semblance of a limited social life existed even in this awful environment. The Bund (the Jewish social democratic worker's party), communist groups, Agudat Israel (a political religious party), and schools continued to meet underground. Once the forced labor started, schools closed and all this activity stopped. 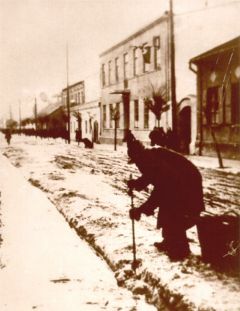 Jews were sent to surrounding towns to clean streets with most of the pay going to the town of Belchatow and some of it going to the Judenrat (Jewish Councils established by the Nazis to govern Jewish affairs in occupied Europe). By March 1942, 5,460 - 6, 000 people lived in the ghetto. Click here to read a translation of "Under the Nazi Occupation" -- a chapter by Leib Podlowski in the Belchatow Yizkor Book on the Yizkor Book Project site hosted by JewishGen. 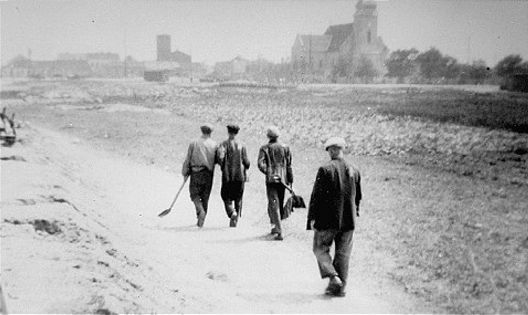 Jewish forced laborers from Belchatow walk along unpaved road (1941). In August 1941, Jews started being sent to labor camps. In the beginning, the wealthier Jews could buy their freedom. The Judenrat tried helping the families left behind that had no means of support. Many conflicts arose over who should get this aid. There were many changes in the ghetto over the next year. In the summer of 1941, a big demonstration was staged against the Judenrat, organized by the Bund, the Communists, and members of the Union of Israel Workers. to Germany for forced labor (1941). The situation grew even worse in the beginning of 1942. Killings became more and more frequent. On March 18, 1942, during Purim (holiday celebrating the rescue of the Jews from annihilation in ancient Persia), the Gestapo (the secret police force of the German Nazi state) arranged a public hanging for ten Jews who were accused of stealing and unlawful trade. This was actually the result of an order from the regional Gestapo commander in Lask, who issued an order in early March demanding that ten members of each Jewish community be hung, ostensibly in retaliation for acts of resistance in the region. Sixteen were rounded up and jailed for the crime, but families were "permitted" to ransom and buy life for six of them (Szmul Jakubowicz, Berl Rubenstajn, Mejer Zuchowski, Jankiel Flakowicz, Szloma Szmulewicz, and Mojsze Klug). The condemned were led from the lock-up on Ewangelicka Street to the synagogue, and then to the execution site. The location of this public hanging was a plot of land owned by Jankiel Ber Lieberman on what is now Mielczarskiego Street. All Jews were forced to witness it and "learn" a lesson from it. The bench was pushed away by a Jew forced to do this, and the bodies were left hanging until nightfall. When the corpses were taken off the gallows, the officer who conducted the execution approached the bodies and urinated on them. The ten victims were: Yankl (Jankiel) Ehrlich , Moshe (Mojsze) Wolfowicz, Laybish (Lajbus) Feldman, Mendel Feld, Yakov Hersh (Statlender's grandson), Moshe (Mojsze) Aharon Toiveh (Taube), Yechezkiel Szpiro [sic], Yerachmiel Boim (Baum), Eliezer Rawicz (a Jew from Lodz), and Laybish (Lajbisz) Michel Landau. Click here to read an account of these proceedings by Leib Podlowski starting on on page 432 in his chapter "Under the Nazi Occupation" in the Belchatow Yizkor Book on the Yizkor Book Project site hosted by JewishGen. During Passover (the spring festival commemorating the exodus from Egypt), the German police caught 400 Jews who did not show up to "sign work cards" because they knew it really meant being sent to labor or death camps. Those caught were sent to the camps. Both men and women were hunted. During June 1942, women were forced to undress and were beaten brutally with sticks and whips. On June 13, 1942, 115 Jews were sent to the Lodz Ghetto to fulfill a quota, while others were sent to labor camps. Click here to read an account of the Holocaust years in Belchatow by Mendel Kaufman in his chapter "In the Years of the Holocaust" in the Belchatow Yizkor Book on the Yizkor Book Project site hosted by JewishGen. The liquidation of the Belchatow ghetto began on August 11, 1942 -- the "final solution" of the Jews in Belchatow. Surrounding the town, the Germans prevented Jews from escaping and killed anyone who made that attempt. The Jews were brought to the synagogue. Of these, less than 1000 were sent to the Lodz Ghetto. 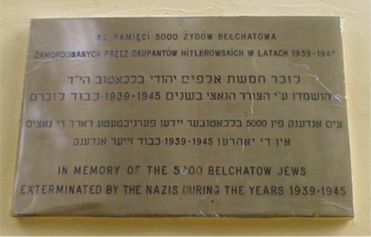 Some 150-200 were sent to clean the Jewish area in Belchatow, which was now empty of its Jews. The rest stayed in the synagogue for three days with no food. Then trucks transported them to the Chelmno Death Camp (see Additional Links below). A few Jews from Belchatow went to Bialystock early in the war and later joined and fought with the partisans in the forests of Bialystock. Click here for a list of names of 593 children killed in Chelmno in August 1942. Click here to see a photo of the liquidation of the Belchatow ghetto, from "And I Still See Their Faces, Images of Polish Jews" -- a virtual exhibit at the Wiesenthal Center's Museum of Tolerance, based on the book by Golda Tencer. Click here to read a translation of "The Four Days of Horror" -- a chapter by Zohken Lieberman in the Belchatow Yizkor Book on the Yizkor Book Project site hosted by JewishGen. Click here to read a translation of An Eyewitness Report from the Journal for the Double Anniversary for the 40 Years of the Mutual Aid Society and the 20th Year of the Cooperative “Superacion” [“Overcoming”], a Yiddish/Spanish publication written in 1980 in Buenos Aires, Argentina, on the Yizkor Book Project site hosted by JewishGen. Click here to read Testimonies of the Last Prisoners in the Death Camp Chelmno, including letters from Belchatowers (scroll down about 3/4 of the way to the tenth letter): Srul Jacubowicz, a carpenter; A[?] Kolton, writing to his friends Hillel and Mendel Belchatowski, while awaiting his own death, about how their family and others from Belchatow were murdered in September 1944; and Israel Belchatowski, a relative of Hillel and Mendel. After the war, a Jewish Community was not re-established. Belchatowers who survived the Holocaust emigrated to many parts of the world (often helped by other Belchatowers who had left before the war) -- including Israel, the United States, Argentina, and Australia. Others resettled in various communities in Europe. Click here to read a translation of "Belkhatov Without Jews" -- a chapter by Yosef Reich in the Belchatow Yizkor Book on the Yizkor Book Project site hosted by JewishGen. It recounts his return visit to Belchatow after the war and the situation he found there, including pieces of his father's tombstone (the one made by his brothers shown on our home page). Click here to see two documents found at the USHMM that list the Holocaust survivors from Belchatow who went to Lower Silesia (Dolny Slask) after the war and formed a Landsmannschaft there. Click here to visit the website dedicated to the Jewish Survivors of Belchatow, containing photographs provided by the families of people in them. (photograph provided by Boguslaw Dziedzic) In Belchatow, the ruined synagogue became a gym, but it was eventually closed and finally torn down in 1956 and replaced by an apartment building for new officials, clerks, teachers, etc. (since Belchatow became a "powiat" town in 1956). The Talmud Torah (Yeshiva) became an office building -- the main office of the weavers co-operative Czyn Majowy. The cemetery was destroyed, and the stones were used for roads and sidewalks, to pave the riverbed of the Widawki River, to repair bridges, and in the foundations of new houses. Click here for a translation of "The Synagogue" -- a personal recollection of the tearing down of the synagogue in 1956 and a history of the synagogue and the revival of interest in Jewish Belchatow -- from a 1996 magazine article by Boguslaw Dziedzic. 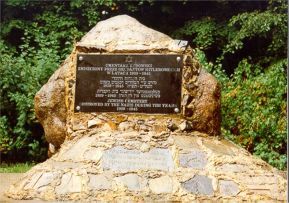 Years later, in August 1989, the Jewish Belchatower Organizations and landsmannschaften and the town put up a commemorative plaque dedicated to the "memory of the 5000 Belchatow Jews exterminated by the Nazis." 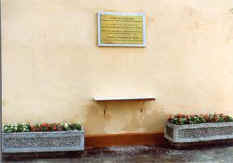 The plaque is on an outside wall of the city cultural center, just opposite the site where the synagogue used to be. In August 1992, on the 50th Anniversary of the Liquidation of the Jewish Ghetto in Belchatow, representatives of Jewish Belchatower Societies, led by Menachem Sharon, former secretary of the Israeli embassy in Warsaw and now chairman of the Belchatower Society in Israel, with the support of the mayor of Belchatow, erected a memorial monument made from parts of broken gravestones in a public park on the site of the former Jewish cemetery. Click here to see photos of the cemetery monument and some close-ups of the broken gravestones. Click here to read a translation of a 1992 newspaper article ("Jewish Cemetery in Belchatow") from the Lodz Morning Voice that describes the history of the Jews in Belchatow, the Liquidation of the Ghetto, the memorial plaque, and the dedication of the cemetery monument. Click here to read a translation of an article, "Belchatow's Jews," by Boguslaw Dziedzic, the Director of the Regional Museum and President of the Association of the Friends of Belchatow, in the Association's Bulletin No. 2, published in June 2001. The article summarizes the history of the Jews in Belchatow, including the Holocaust and the return of some survivors in 1992 on the 50th Anniversary of the Liquidation of the Ghetto. Click here to read a translation of the first chapter of the Belchatow Yizkor Book, "The History of the Jewish People in Belchatow" by Dr. Phillip Fridman, on the Yizkor Book Project site hosted by JewishGen. Click here to read the "Belchatow Holocaust Chronology" compiled by Sam Faivish, a survivor from Belchatow, for his book, My Story © 2002, edited by Andrea Knight. We Remember Jewish Belchatow -- Ada Holtzman's website. We Remember Shoah -- Ada Holtzman's Holocaust website, including information on Chelmno. Chelmno Extermination Camp -- the chapter on Chelmno from German Crimes in Poland, published by the Central Commission for Investigation of German Crimes in Poland. The Chelmno Death Camp -- more information and descriptions of the camp and testaments of the last prisoners, stating towns of origin and family information. Chelmno, 1999 -- photographs of present-day Chelmno, on Holocaust-info.dk (click on "Chelmno" in left margin), a Danish site "dedicated to informing about the Holocaust and refuting those who attempt to further racism, anti-Semitism and nazism by denying this event." The Jewish Virtual Library -- information on the Holocaust and the Chelmno Death Camp. The Simon Wiesenthal Center Online. The Simon Wiesenthal Center's Museum of Tolerance Online and its section on Belchatow. Yad Vashem -- The Holocaust Martyrs' and Heroes' Remembrance Authority dedicated to commemorating and documenting the events of the Holocaust, publishing testimonies to the Holocaust, collecting and memorializing the names of Holocaust victims, and research and education. The Chamber of the Holocaust -- on Mt. Zion, in Jerusalem, a commemoration of the Holocaust, with tablets of over 1,600 communities, now bereft of Jews. Jewish Web Index -- Ted Margulis' website, including sections on Holocaust and Poland. SOURCES: Kiddush Hashem: Jewish Religious and Cultural Life in Poland During the Holocaust, by Shimon Huberband, published by KTAV Publishing House, Inc. and Yeshiva University Press, 1987, pages 272-273; The Ghetto Anthology, by Roman Mogilanski, American Congress of Jews from Poland and Survivors of Concentration Camps, 1985, pages 90-91; Encyclopedia Judaica, volume 4B, Keter Publishing House Ltd, 1971, page 414; "Pinkas Hakehillot Polin" Encyclopedia of Jewish Communities POLAND, Volume 1, pp. 70-77, published by Yad Vashem; "The Jews of Belchatow," by Rafal Gorniak, 1993, high school history paper that won him a trip to Israel in a national competition; personal recollections of Andrzej Selerowicz and Boguslaw Dziedzic. This page last revised February 18, 2007. Copyright © 2001-2016 Roni Seibel Liebowitz. All rights reserved.